The object's vast orbit is so vast that it takes about 40,000 years to do one circuit around the Sun. Yet, its orbit is highly eccentric. It distance from the Sun varies from 64AU at perihelion to 2037AU at aphelion. Incredibly, then, it skirts both the Kuiper Belt and the inner Oort cloud, transiting between these quite distinct belts of objects. 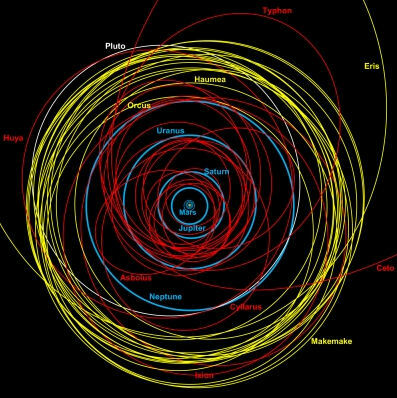 As more objects are discovered between the Kuiper Belt and the inner Oort cloud (a torus-shaped disk of comets), the classifications of these objects are becoming more complex. A significant factor is whether these objects have perihelia within 40AU, which might briefly bring them within the influential scope of the planet Neptune. Extreme scattered disk objects fall into this category. Significantly, 2015 TG387 is fully detached from this influence at perihelion, and may be considered to be an inner Oort cloud object. 2015 TG387 has been unofficially given the name 'the Goblin' by its discoverers (3). As its name implies, it was originally discovered in 2015. However, because its is so far away, it has taken three years to pin down its orbital path sufficiently accurately to determine its bizarre orbital properties. It seems that other discoveries of distant outer solar system objects, made in the last few years, are similarly being scrutinised (3). 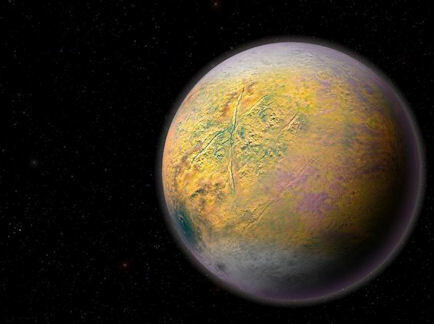 In the near future, these may offer further tantalising evidence of the elusive Planet X. One of the essential ingredients of planet-building is the clumping of dust in space. Planets can build up through the gravitational attraction of objects in space which are already about 1000km across. 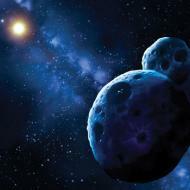 The problem is how do these proto-planetessimals get built? The mechanism for how dust clumps together has not been well understood. After all, when materials moving at speed through space collide, they may break apart in the force of the impact, showering down collisional cascades of ever small materials - the exact opposite of planetessimal-building. Somehow, dust must clump together into grains, which then join forces to create space pebbles, then boulders, then mountains, etc. Well, well. Regular readers of the Dark Star blog will recognise that this is a theme that I have been exploring for a few years, in an effort to explain how planets might form in interstellar space. I have wondered for some time how a substantial Planet X body might have formed beyond the extent of the Sun's early proto-planetary disk. I realised that there must be a missing mechanism for planetary formation - that it needn't just be taking place in proto-planetary disks (which it clearly is), but that a slower mechanism for planet-building might also be taking place outside these zones. This was not self-evident, because the Sun clears out the zone around it of dust and gas through the action of the solar wind. The solar wind impedes slow planet-building mechanisms within the planetary zone. Because the planetary zone is what we can observe, we are none-the-wiser as to what's going on beyond it. Beyond the heliopause, the mechanism for dust extraction is not taking place in the same way. In interstellar space, particularly within large gas clouds, there should be scope for gradual planet-building. That could extend, intermittently, to the outer solar system, particularly when the solar system moves through gigantic molecular clouds, nebulae, and the like. I wrote this up in a paper in 2016 (4), and have included broad discussions about it in my new book 'Darker Stars', which will be published soon. In 2016, I submitted my paper for publication in MNRAS, but it was rejected on the grounds that it lacked scientific rigour (fair enough - I don't have super-computers at my disposal, after all) and wasn't adding anything new (this reason really puzzled me - I have not come across the concept of planets forming in interstellar space anywhere else in the literature). Planet X-type bodies can grow slowly over time because, beyond the heliopause, they reside in interstellar space where dust may clump, free of the action of the solar wind. Because this is a general principle, any older star system may have one or more wide-orbit planets beyond its heliopause, perhaps a number of them. This mechanism could lead to the formation of an abundant supply of dark, free-floating planets in interstellar space. These need not have been ejected from young planetary systems, but could be native denizens of interstellar space. Continued dust clumping in the vicinity of substantial Planet X bodies will be aided by the juxtaposition of moving interstellar medium and their powerful planetary magnetic fields. This will lead to the accumulation of shrouds of dust around substantial Planet X bodies (6). The same would apply to free-floating planets. This would then explain why the presence of a Planet X object can be strongly inferred from indirect evidence, yet continue to evade direct detection. This argument seems logical and coherent to me. It seems that science is now providing the mechanisms whereby it could be substantiated. It also seems something of a coincidence that this work is emerging from Caltech, now so famous for the Planet Nine hypothesis (8). Is it part of a similar push to understand how Planet Nine could be? I would argue that this helps beyond providing the mechanism for its formation (as important as that is). It will also explain why we can't seem to find it. The cut-and-dried nature of the defined categories of solar system objects seems to be constantly under fire. When are comets really asteroids? 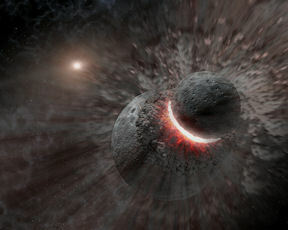 Were water-bearing asteroids, capable of crossing Earth's orbit during the early solar system, the bringers of Earth's water? Such questions are rendered more complicated still by theories of solar system formation, within which sit complex patterns of planetary migration. It's becoming ever more difficult to determine where any particular object originated from. The complex evolution of the solar system shifts the ground between the feet of astrophysicists charged with trying to understand this melange. They can reasonably easily categorise objects into collections of objects. 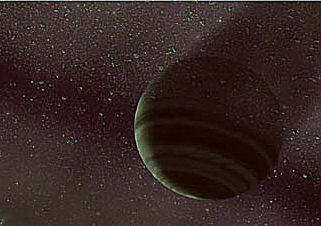 For instance, giant planets have 'followers' in stable pockets set along their orbit, which are known as Trojans. There are other collections of objects past the known planets, including those within, and beyond, the Kuiper Belt. Then there are the Centaurs. Centaurs are minor bodies in the solar system which orbit the Sun among the giant planets - in other words, between Jupiter and Neptune. They seem to have emerged from the Kuiper belt originally, and their current paths are an expression of a gradual orbital evolution. Although the Centaurs generally stay within this outer planetary zone, new research emerging from the University of Vienna (in collaboration with Brown University) indicates that just over 50% have been capable of moving within Jupiter's orbit during the 'modern era'. Some of these, amounting to 7% of the total known population of Centaurs, have been capable of interacting with the inner terrestrial planets, extending as far into the inner terrestrial zone as Venus (1). The implication of this is that Centaurs may have impacted our world in the past, just like asteroids and comets. As a result, the water on Earth may, at least partly, have been delivered here by Centaurs, which themselves originated from the belt beyond Neptune. This seems to be the equivalent of the amount of water in the Adriatic sea (2). Other terrestrial planets, like Mars and Venus, may have also received deposits of Centaur water in the past. The main period during which these bombardments took pace occurred during the 'late, heavy bombardment', which began about 4 billion years ago. The solar system eventually settled down after quite an extended period of impact activity (perhaps half a billion years long). The evolution of the orbits of the Centaurs calculated by the astrophysicists goes back to this tumultuous period, and presents the likely role played by the Centaurs in cratering the terrestrial planets since then. Working from the known Centaurs population - assumed to be stable during the "modern era" since the late, heavy bombardment - there have been perhaps two catastrophic events on Earth attributable to a Centaur impact. 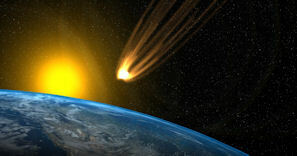 One might have been the Extinction-Level Event that is thought to have wiped out the dinosaurs, although this particular event could also have been due to the incursion of an asteroid or a comet. Until this work, Centaurs had not been considered a threat to the Earth. Dark planets moving independently through interstellar space are known to exist - a patchy picture has been built up gradually from the discoveries of rogue young brown dwarfs, microlensing events and infrared sky surveys . How many are out there is much less certain, with estimates hanging around the same number as that of visible stars: Sometimes more; sometimes considerably less. The truth is, no one really knows. The assumption is made that all of these sub-stellar worlds originated from star systems, and were ejected during the chaotic early stages of planetary formation, and subsequent periods of planetary migration. As noted above, I think that there is also a case for these objects to form, and build in interstellar space, but that is not generally accepted thinking, by any stretch of the imagination. Recent computer simulations by astrophysicists have sought to determine whether ejected gas giant worlds might manage to hold on to their moons. It turns out that a significant proportion of these moons do indeed ride out of town with their parent planets; perhaps three quarters of them (1). There are implications for life here. As I have been writing about for about 20 years now, moons orbiting gas giants are internally warmed by the proximity to a massive gravitational force. This process of tidal warming can maintain internal conditions suitable for life (like sub-surface oceans). If you step up the parent's size to a sub-brown dwarf, then this warming effect is compounded by the moon's proximity to a relatively warm object capable of producing flaring, aurorae and a massive magnetic field. We often think of moons as being rather like our own - desiccated, barren, lifeless. But there need not be a limit to the size of the moon, or a strict set of properties applied to it. There is nothing to stop a gas giant binary, for instance, or an ice giant orbiting a gas giant. Such a system has been discovered recently using the Hubble Space Telescope (2), although its cautious announcement by the astronomers from Columbia University comes with caveats (3). The host planet, Kepler-1625b, orbits the star Kepler-1625. The light from the planet is dim, and essentially is mixed in with that of the star's. Often planets are discovered as they transit across the face of a star, dimming it. So, if you want to find a moon, you would look for a much fainter secondary dipping of light from the star/planet combination. This tiny dip might well be attributable to a substantial moon - the size of Neptune or Uranus - crossing the face of the star during that main planetary transit, causing a further fluctuation in light. To be sure, such a fluctuation would need to be observed on more than one occasion, and the proposed existence of a moon around Kepler-1625b need confirmation from further careful observations of the system. This planet and moon orbit a star. Nonetheless, there's nothing stopping substantial binary planets like this from being ejected together into interstellar space. They would effectively become dark planetary systems. If the main object is a sub-stellar object like a sub-brown dwarf, then the potential for life within such a system moving through interstellar space is surely good, if not excellent.